On our new iPhones, we can tap, swipe, pinch, peek, and pop. We can hold them, but they don't hold us back. This something we can only accomplish with each other, in person, together. Co-authored by Mylea Charvat, Ph.D. Connection. Closeness. Intimacy. Things we need, things we crave. That moment of calm when your partner wraps their arms around you in a hug. The security you feel when you reach out and grasp their hand. As humans, we need touch. We respond to it, emotionally and physically. Now, technology responds to it too. In September, Apple released its latest iPhones, the 6s and 6s Plus. Their most exciting feature? 3D Touch. The new devices come equipped with pressure sensitive screens that respond to touch, allowing you to "peek" and "pop" within different apps. Press medium hard for a peek, harder for a pop. We can now interact with our phones in new, almost human, ways. This technology creates and heightens intimacy with our devices. But a Retina HD display, capacitive pressure sensors, and taptic engine will never provide us with the deep feedback and connection vital to our existence. What does? Human-to-human touch. Watch two people together. Observe how they mirror one another's pace of speech, tone, and body language. Then watch as small touches happen: a hand on an arm, a nudge of an elbow. It's a sort of dance, as two human brains connect through their bodies. This isn't tangential to human communication -- it's the heart of human interaction. We need it to know how to feel about and relate to others. We need it to feel accepted, to have empathy. Technology helps us communicate us with each other in unprecedented ways, and we also require physical touch. Yet we're compelled to spend more time on our phones, tablets and computers, and we interact with each other less and less. It's my belief that technological advances should reinforce and leverage our most basic need, not drive us away from it. Something magical happens when humans touch one another. It's released in our bodies with physical contact. As a neuroscientist, I know the name of this magic: oxytocin. 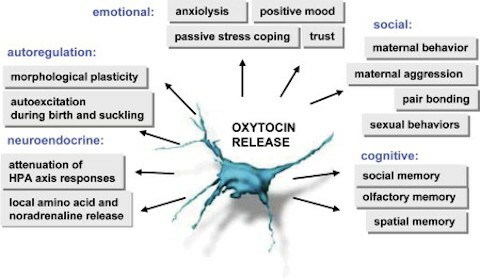 Oxytocin, known as the "love hormone," showers our brains and bodies, causing feelings of calm, attachment, and/or arousal. It's known to decrease stress including lowering the levels of cortisol, the stress hormone, in our bodies. Here's a secret: No matter how cutting-edge the sensors on our phones become, only human-to-human contact elicits the oxytocin response. Touching a device doesn't cause us to deeply connect with it. Our bodies won't bond to our phones, even if we're FaceTiming with a loved one. And regardless of how personal it can feel when your computer crashes, machines have no "intentional stance," a phrase dubbed by philosopher Daniel Dennett, referring to a strategy of understanding and intentional behavior toward another being. You'll never get that from your phone, Facebook, or an email. Empathy and compassion are necessary aspects of our experience. Their development and perpetuation requires physical contact. Our humanity is predicated, enhanced, and enriched by touch. When we touch and are touched back, we're more efficient, compassionate, creative, and kind. Humans are social creatures -- we are not meant to exist in isolation. In fact, isolated humans are more prone to illness, depression and acts of violence against others. Not long ago I heard a man speak about the future of medicine. He painted a glorious picture of a utopian world where human doctors are replaced by robots that deliver error-free care. As I listened to him speak, my limbic brain -- the part that regulates emotions, decision-making, and also higher thought -- reacted with alarm. Through years of research and clinical work I know that there's no substitute for human touch. No technology can mimic eye contact, a gentle hug, laughter, or a sturdy set of arms in support of another being. Not only does that sort of interaction have proven value to patients, imagine for a moment a world where we no longer physically care for one another. If in our enthusiasm for technology we create a world where we are no longer required to care for one another what are the limits to that selfishness and what is the cost? The most cited proof of the power of touch is illustrated in the neonatal intensive-care unit (NICU). The NICU is where ill and premature infants -- arguably the most fragile humans on this planet -- are given medical treatment. Among babies in the NICU, the ones that thrive best receive what is called "kangaroo care." Kangaroo care is skin-to-skin contact, during which a baby is held against their parent's bare chest. The amount of skin-to-skin contact they have with a loving parent predicts everything from their ability to sleep, to their breathing patterns and ability to come off the ventilator. Perhaps even more fascinating is that skin-to-skin care from another care-giver such as a nurse does not provide the same benefit as the loving touch of a parent. Even as newborn humans our bodies and brains read the intentional stance of others. No robot -- however error-free -- can replicate this experience. We have evolved to need human touch in order to develop trust and connection. Over millions of years our brains have learned to read other humans. We know immediately to either trust or distrust them, to form bonds of friendship, partnership, or love -- based on the interaction of brains and bodies in a dance as old as time programmed into us over hundreds of thousands of years of evolution. We cannot undo that programming in the short arch of technological change we are experiencing now. As babies in the NICU demonstrate, this is not learned. It is innate. Our brains rely on the sharing of implicit information through touch to form trusting bonds with one another. These bonds are essential for compassion, altruism, empathy, and understanding. I'm not knocking technology -- in fact I'm the CEO of a start-up health technology company that delivers assessment and mental health intervention tools via mobile devices -- but it cannot replace human touch and interaction. At its best, technology informs, enlightens, improves, and ultimately brings people together. It's our hope as we create our company that technology allows us to be more present, less distracted, and more "in touch" with one another, literally and figuratively. The best digital touch technologies will be those that also encourage physical touching, to be sure we're all getting kangaroo care, cradle to grave. Right now, reading this article, you may be holding a phone in your hand. And as you know, your phone isn't holding your hand back. We live in a culture where our computers and phones are essential for us to conduct business, and keep up with family and friends. But we need more balance between these tools, and human contact. We can choose to make eye contact with others rather than look at a device. We can put down our phones and instead offer our hands in affection, assistance, or kindness to another human being. When we do, our brains light up and we become kinder, more empathetic creatures. I encourage each of us to develop the habit of prioritizing people over devices. In my own life, areas of my home are a "no phone zone." I spend time with my family, going on walks, holding hands, talking, listening, making eye contact, and sometimes just being silent together. A friend of mine enjoys regular, device-free dinners out. The next time you're in a restaurant, hold hands with your partner and look around. How many people are on their phones, ignoring their dinner mate? So do yourself a favor every day. Hold hands with someone. Let's think of it as a million-year-old software and hardware combination, that upgrades daily -- for free -- for the rest of your life. No data charges, no dead batteries, no cracked screens. Find your person, interlace your fingers. You'll both be glad you did. Mylea Charvat is the CEO and Founder of Savonix (www.savonix.com), a San Francisco based start-up building the worlds first evidence-based mobile cognitive assessment tool and complementary gaming and brain health platform (Facebook page). Mylea is a translational neuroscientist and completed her Ph.D. Fellowship in Clinical Neuroscience at Stanford School of Medicine.